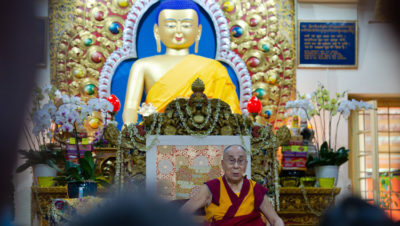 September 7, 2018, Thekchen Chöling, Dharamsala, HP, India – In the final session of this year’s teachings for Buddhists from East and Southeast Asia His Holiness the Dalai Lama sat on a chair in front of the throne in the Tsuglagkhang and invited the audience to put questions to him. He began by explaining that the real meaning of the Dharma is warm-heartedness. “If you can, serve others, but at least avoid doing them harm. That’s possible whatever your occupation. It’s important to make your Dharma practice part of your daily life. It’s not about just closing your eyes and remaining in isolation. There’s nothing wrong with making money; it’s something we need. And there are many people who are both poor and lack an education who you can help. So, try to be warm-hearted, honest and truthful, while helping others as much as you can. “To maintain energy in your practice you have to remind yourself that it’s up to you. The Buddha made clear that the Enlightened Ones don’t wash unwholesome deeds away with water, nor do they remove the sufferings of beings with their hands, neither do they transplant their own realization into others. It is through teaching the truth of suchness that they help beings find freedom. The key is to transform your own mind and emotions. His Holiness told someone who wanted to know how you could be of great help to others if you just stay in one place that among her acquaintances there are probably some people who make her uncomfortable. “Remind yourself that like you they also want to be happy. Then you’ll be more inclined to be more compassionate towards them. By such means you can extend a positive concern to all 7 billion human beings alive today and eventually to all the sentient beings in the universe. “Let me give you an example. On 10th March 2008, the day Tibetans commemorate the Lhasa Uprising of 1959, I received a message that Tibetans in Lhasa and other parts of Tibet were going to hold demonstrations. I was filled with misapprehension that this would lead to a harsh response. I feared demonstrations would be suppressed, resulting in more suffering. Another questioner explained that in the face of disturbing news there’s a tendency to look the other way to maintain your peace of mind. She wanted to know what else you could do. His Holiness agreed that reports of suffering are upsetting, but that it’s a mistake to think you can do nothing about it. Many of the problems we face are of our own making. Since we are social animals who need friends, His Holiness remarked, the least we can do is to smile and respond to others warm-heartedly—even that will make a difference. “Modern education is oriented towards material goals, so from infancy children grow up seeking sensual gratification and the fulfilment of material aspirations,” His Holiness noted, “but they don’t know how to achieve peace of mind. Ancient India saw the development of an effective understanding of the workings of the mind, derived from the practices for developing a calmly abiding mind and penetrative insight (shamatha and vipashyana) that remains acutely relevant today. “I have great respect for the Judeo-Christian traditions in which so much depends on God the creator to whom you direct your prayers, but here in India there developed several different traditions, including Buddhism, according to which what happens depends on what we do. Therefore, we have to take responsibility for tackling our own destructive emotions. We have to train and transform our own minds. “We all know people who tend to be angry, but even they are not angry all the time because anger is not actually part of our minds. If it were, there’d be little we could do. Anger is often closely related to attachment and both anger and attachment arise because of ignorance and distorted views. We can uproot them by using our human intelligence. From a wider perspective educationists agree that we have to start work now to bring up a new generation with a fresh point of view and secular, human values. 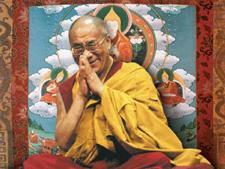 “I tell my Indian friends that in the past Indians were the gurus and Tibetans were the disciples or chelas. However, we have proved to be reliable and have kept alive the knowledge we received. Partly as a result of an education system imposed by the British, Indians have neglected this store of knowledge. That’s why I am encouraging a revival of these traditions in the country today. The ideal result would be a combination of modern education with ancient Indian knowledge. Earlier this year I met with 150 Vice-Chancellors of Indian Universities who showed genuine interest in this idea. “If we succeed in restoring interest in ancient knowledge of the workings of the mind and emotions here in India, the next target could be China, a traditionally Buddhist country. When Xuanzang came to India, he studied at Nalanda. Today, many Chinese feel close to Buddhism, in fact a Beijing university a few years ago estimated there were 300 million Buddhists in China, since when I’ve heard the number has grown. Efforts to eliminate corruption in China would be more productive if people were simply more honest and disciplined. That is not dependently arisen.